Education Lifeskills Courses are built on ACCI’s evidence-based model of cognitive restructuring and has been refined for over 40 years. Each of our Social and Emotional Learning courses uniquely help students make improvements in all of the 5 major categories for Social and Emotional Learning as set forth by the Collaborative for Academic, Social, and Emotional Learning (CASEL). 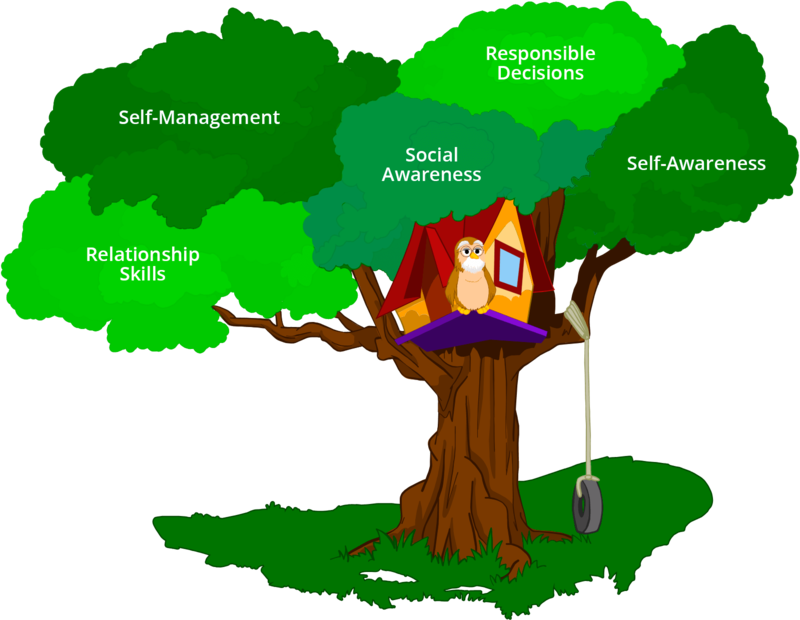 Explore different parts of the tree to discover how our cognitive life skills curriculum helps to address each of the 5 SEL categories. The first step to self-improvement is always self-awareness. To develop self-awareness, we use well written vicarious stories to disarm and challenge students to see themselves in new and more positive ways. We also address each student’s emotional hierarchy of needs. The curriculum challenges underlying thinking errors that originate in the subconscious mind. Our Social and Emotional Learning self-directed learning approach ensures that each student has pro-social thinking skills which are reflected in improved default responses to the stressors and stimulus in their surroundings. Social awareness starts with empathy – the ability to understand and display compassion for those you associate with. Our curriculum gives students the opportunity to determine their level of empathy and identify ways to ipmrove through self-evaluation, gamification and other learning activities. All of our courses invite the student to complete a course with a parent or mentor. Instead of teaching a student about relationship skills, we help them use, build and experience relationship skills as they complete a course. Our mantra is that today’s students can rise no higher than the thoughts they have about themselves. To effectively help students make improvements in these 5 major areas of life, their subconscious mind must be facilitated and challenged from an inside out approach. Get started by creating a Lifeskills Link Account and enrolling students into one of our courses or contact us to learn more about campus wide programs.